This ArmaSkin sock review focuses on the innovative features of a new-to-Hiking For Her type of socks for hikers. To fully appreciate these socks, you should take a look at the conditions which lead to a blister inside a hiking boot. You should also observe how the thoughtfully engineered features of ArmaSkin socks are designed to combat blister formation on a hiker's feet. That's what this Armaskin sock review aims to do for you. Full disclosure: This ArmaSkin review began when ArmaSkin contacted me to suggest that I try a pair of these socks on my next hiking trip. 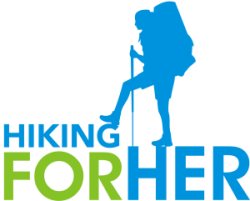 No financial arrangement exists between ArmaSkin and Hiking For Her. As always, this review simply asks, and answers, the pivotal question "Will this gear work for a hiker?" 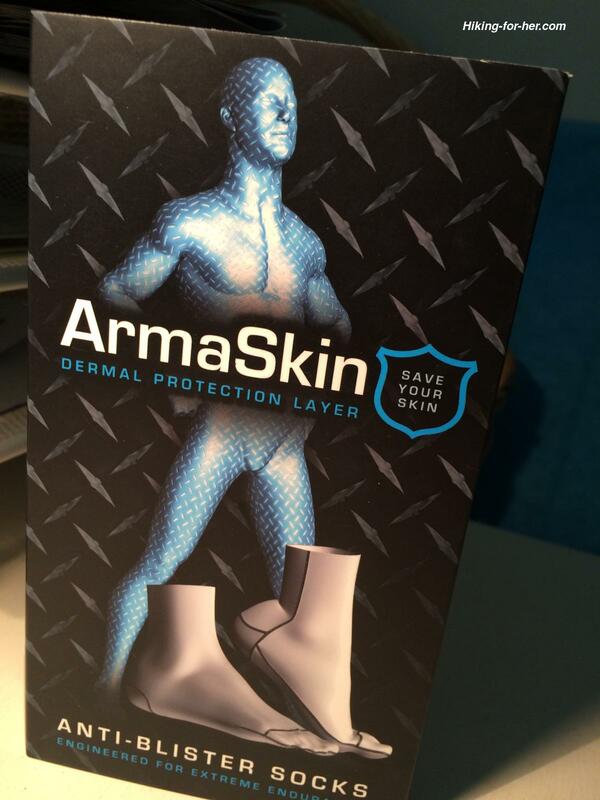 Now let's dive into the details of this ArmaSkin sock review. These three conditions must exist to create a blister. When you remove your hiking boot after a long day on the trail, you have ample demonstration of this blister triad. In fact, taking off your hot boots is probably one of your favorite parts of the hike. Peeling your stinky, soggy socks from your wet feet runs a close second! Here's why your socks play an important role in preventing blisters. Your feet generate heat and moisture as your muscles contract and your blood flow directs excess warmth away from your body. Sweat is the body's wise way of dumping that heat, trapped in water, into the external environment. For hikers, that's inside a boot or trail shoe until you take them off. All during your hike, your socks have to not only absorb heat and moisture, but wick them away from your skin. But there's a third, more sinister variable at work here: friction. Your skin rubs against your socks. Your socks rub against the interior of your boots. And there may be grit, sand, pine needles and other trail debris to make things even more interesting inside your boots. Given enough time, vigorous activity, and the right (or should we say WRONG?) conditions, the upper layers of your skin (epidermis) can get separated from the lower layers (dermis). This creates a little pocket of space which fills with fluid as it's released from dead and dying cells and/or damaged blood vessels. Regardless of its size, a blister is going to hurt, which in turn will slow you down. It's also going to provide an open doorway into your bloodstream if it pops. So as a hiker, it's best to avoid blisters. Anti blister man on the packaging! If you've never tried on a pair of "smart" socks, here's your chance. 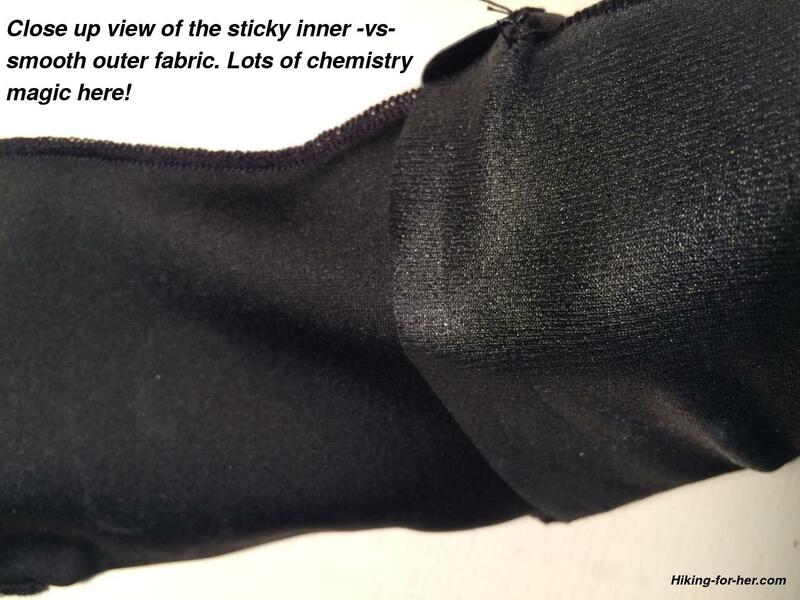 A special sticky coating (SiFusion) on the inside of the sock prevents friction generation on the skin; the sock sticks to your skin, rather than slipping around. 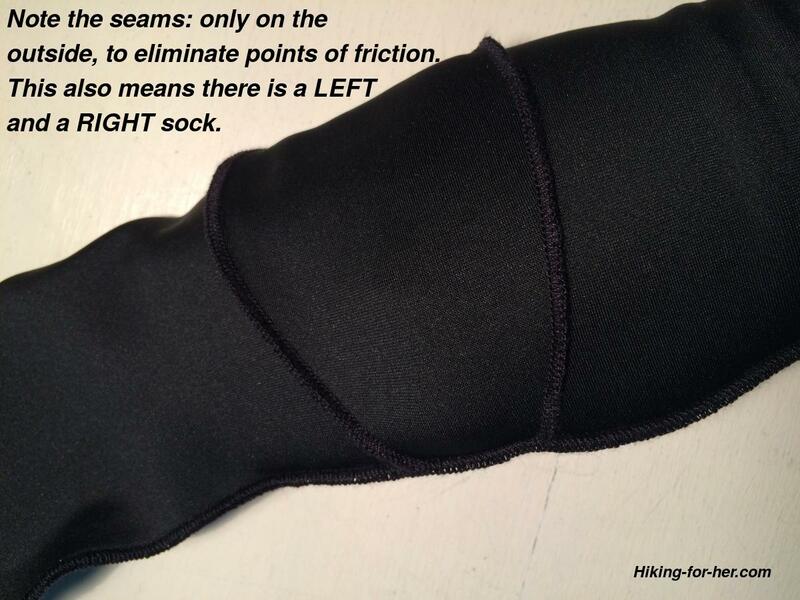 The smooth outer fabric of the sock takes care of friction generated by your foot moving inside your boot. Stitching, only on the outside of the sock, is flat and eliminates pressure points. The SiFusion inner layer wicks moisture from your skin to the outer layer, eliminating the possibility of moisture weakening your epidermis. The sock fabric is a blend that provides a contoured yet flexible fit: 87% polyester, 16% spandex, 5% silicone. No cotton to be seen! The SiFusion polymer blend is unpalatable to microbes, thus cutting down on the chance of skin infections and odors. How did these liner socks perform on the trail? The answer actually begins well before any trail time. Let's take a close look at these anti-blister hiking socks. The first thing you'll notice about these socks is the extreme difference between the inner layer and the outer layer. They're very different from other technical hiking socks! Putting on these socks is not like sliding on an ordinary pair of liners. The adherent inner coating is sticky by design, so it won't slip around on your skin to generate heat and friction. That's the whole point of anti-blister socks, right? ArmaSkin kindly provides a video to demonstrate the technique required to get a perfectly contoured fit. I recommend that you watch it to avoid bunching or twisting the socks. A good fit is critical to their performance on the trail. Once the left-right, inside-outside thing has been figured out, and the socks are on your feet, you will appreciate the snug fit and flat seams. These socks are going to stay put on your skin and interrupt the nasty blister triad discussed above. To be honest, the snugness gave me pause. I'm not a fan of constricting fabrics anywhere on my body. In fact, I wear hiking shirts and boots that are a size "too big" in order to avoid feeling confined. So the first item on my "watch for this" list was about the contoured fit. Another potential red flag for me was the sticky inner fabric. What if I dropped the socks in the dirt as I was trying to put them on? Would trail debris and grit cling to it? My outer hiking socks slid on easily over these liners, due to the smooth outer fabric. So once the ArmaSkin socks were seated correctly on my feet, it was a breeze to finish getting booted up. No comfort issues, beyond the snug sensation. My feet generally don't bug me until I hit double digit mileage, but I was definitely aware of these socks throughout the hike. That's not a bad thing, just a note comparing them with my usual poly blend or silk hiking sock liners. These socks are machine washable. Just don't subject them to high heat, bleach or fabric softeners. You don't want to destroy the chemistry magic, right? I don't yet know how fast these socks would wash 'n dry during a backpacking trip. But there is no evidence to suggest that they wouldn't dry fast if hung up in the tent overnight, given the blend of materials (see above). Update: They dry best when placed inside out, underneath your sleeping bag, to capture your body heat. All of the design features, antimicrobial fabric and moisture wicking materials push the price point into a range that a casual hiker might question. For serious hikers, good hiking gear is a serious investment. High performance socks can keep you out of Blister Land, which is a small price to pay if you total up your time, money and effort costs for a backpacking trip. Keep your toenails really short so the socks fit correctly around your toes. This probably isn't critical in looser liner socks, but it would definitely be a big deal in these form fitting socks. If you're a hiker who is prone to blister formation, you need to check out these socks. Every design feature makes good sense from an anatomical and physiologic perspective. The learning curve of donning the socks might give you pause, but so will blisters, and once you get these socks on your feet your blister troubles might be over. For thru hikers, section hikers, and backpackers with aggressive mileage itineraries, Armaskin socks will protect your most precious asset: your ability to rack up the miles without any foot issues (blisters, but also skin infections from funky socks). Casual day hikers, or hikers who don't get blisters, probably don't need this "engineered for extreme endurance" type of sock. But if you're curious, try them! A transitional hiker - someone who plans to begin hiking a notch or two above their usual limits and begin to enjoy backpacking trips - should consider the extra level of protection these liners provide. A hiker who is also a trail runner, especially a competitive endurance runner, would find these socks a welcome addition to their sock drawer. Sock connoisseurs and aggressive hikers, take note of this ArmaSkin review! My husband was casting envious glances toward these anti-blister socks, so I let him borrow them for two hikes while he was breaking in a new pair of leather hiking boots. "Once your feet are in the socks, and your outer socks are in place over these liners, and both pairs of socks are in the boots, there is no sliding between any of the layers." "No sliding = no friction, so it's unlikely that blister formation will occur." "These socks don't bunch up under your foot." (Note: This happens with his other liner socks, making him cranky). "Once you put them on, they stay in place." "Wearing these socks made the breaking in process with leather boots less uncomfortable." "My feet feel cooler, compared to silk liner socks." 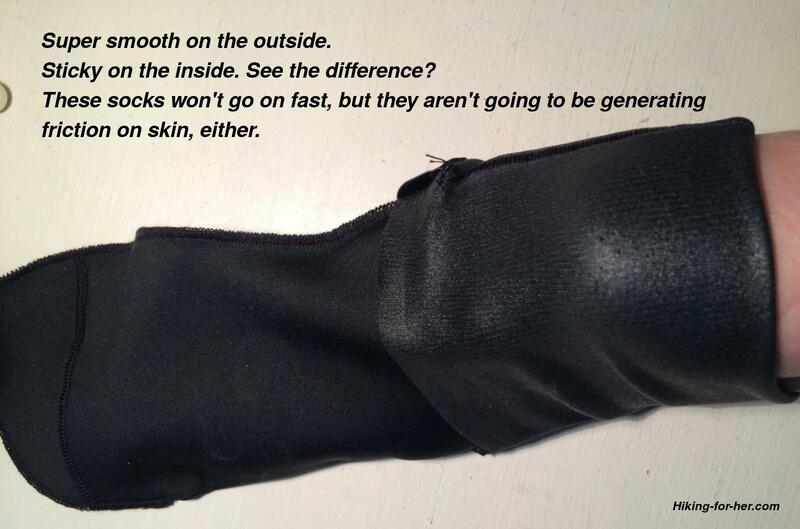 So there you have it: another round of information in this ArmaSkin sock review. Tip: These socks make an excellent gift for hikers. Guess what he got for his birthday this year? "The socks arrived and I finally tried them out on a two- hour hike with my grandson in his backpack yesterday." "Great socks! Not a red spot to be found anywhere on my feet and there is usually something rubbing with that baby on my back." "I was worried that they might not breathe well, but no problem there, either." "I wore them alone and did not layer them. I wear Merrell hiking shoes." "I really like them and will be ordering several more for my spouse and daughters." This ArmaSkin review was written to give you a new weapon against blisters from hiking and backpacking. Get your very own pair and give them a try! For more ideas on blister prevention, read this. Here are some treatment options. Don't be defeated by your feet. Be proactive by choosing the best outer socks for your style of hiking, paired with Armaskin. Send your questions and comments here. Happy blister free hiking this season!